This is Tiffany Schmidt, everyone. The author of three sterling novels- Bright Before Sunrise, Send Me a Sign, and Hold Me Like A Breath- Tiffany has been on the writing radar since 2012, but she’s only been on my radar since early this year, when I noticed Hold Me on a goodreads.com recommended page. And then, suddenly, I was obsessed! The gorgeous cover, the thrilling plot- I got excited just thinking about it! May 19th, the release, seemed so far away. Then I was so graciously bestowed an ARC from the publisher, and believe me, everyone, it’s fantastic. I didn’t want to write my full review until I got my hands on the finished copy (it’s on my shelf at home and in my plans for a road trip this weekend, don’t worry), but I know it must be stellar if the ARC was that good. I love the concept of her newest series- a crime family that specializes in organs? What? YES, please! For some reason I have an odd fascination with such things, but it’s hard to find a book that doesn’t fall flat with descriptions or character development or some other aspect that’s obviously really important. But Tiffany does a really great job making the characters stand out and each feel as if they have something new and different to offer- it’s really a cool thing to see how an author can just make a world come alive, and Tiffany Schmidt does a great job with that. This post, and all normally scheduled posts this week, are going to be a little bit on the short side, because every evening I’ll be promoting Vengeance Road and Erin Bowman‘s release of FIVE CHARACTER BIOS! YAY! Your first glimpse into the world of Vengeance Road will come later tonight with the main character, Kate Thompson, and believe me, you’re going to love her. So stay tuned and don’t forget to check my Twitter (@rosieposiekayla) for updates and fun things! She’s awesome. That’s the first thing you should know. 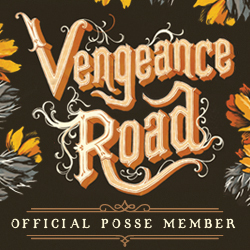 And she’s got an amazing book coming out this fall, Vengeance Road, a wild western throwdown that’ll knock your socks off. (I mean, I’ve only read the first three chapters, but seriously. It’s really good. See this coming Waiting on Wednesday for more info). She’s always been into stories, and she released her first book, Taken, in April of 2013. That’s the first in a series, which includes three books and a novella. You can find her full bio, as well as more pretty pictures and info about her books, on her website at www.embowman.com. As with Sharon Cameron a few weeks ago, Erin is featured today because she’s personable. From emojis to romantic comedies, she’ll tell you what she things and she’s got some great opinions. I’m indebted to her for being the one to give me the final push to watch 10 Things I Hate About You. Here’s a hint- I LOVE IT. It’s been a long haul towards this revelation, but finally I see that I’ve been a fool. Back to Erin- she’s really fun to talk to, and her writing is super-stellar. I love the way, in Vengeance Road, she writes likes she’s in the Old West, and although sometimes that can turn me off from books, Erin uses it in a way that doesn’t overpower the storyline, but enhances the way you see the plot come to life in your mind. There’s magic in that- a writer who can make their book come to life in your mind. 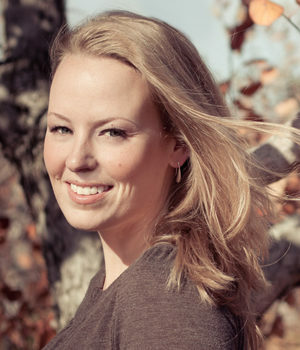 And that’s why Erin Bowman is my author of the week. Sharon Cameron has written three books, two in a series and one, her most recent, a standalone. Her series is a steampunk-adventure historical fiction, the first entitled The Dark Unwinding and the second, A Spark Unseen. I have these two on my to-read shelf, and I’m really looking forward to them after finishing her newest book, inspired by The Scarlet Pimpernel, called Rook. I was in love with that book the whole time I was reading it, beginning to end, and I can’t wait to read her series. Well, first of all, Rook absolutely blew my mind. It combined a classic tale with a unique, anti-technology future world that was both gloriously detailed as well as chillingly possible. The characters were fun, well-written, and each had distinct personalities, so it was easy to distinguish them while reading. A full review is coming later, so I won’t go into detail, but I laughed, I cried, and all the while I tweeted about how I was feeling. And the biggest reason I love Sharon Cameron? She responded. A few of the tweets I wrote I tagged her in, and she would write a short reply or favorite the tweet or whatever, but there was acknowledgement. The one thing authors can do to make me absolutely adore them is to be kind to their fans. And I’m not talking just at book tours or signings- I’m talking about something like this. When they respond to us everyday people when we don’t expect it. So thanks, Sharon, for making my day/week/forever! I highly recommend Ms. Cameron to everyone- she has amazing ideas, her writing is phenomenal, and she’s very personable, making you feel like a friend with just a few words. I love her book and I love her attitude, and I’m so glad she has previous books I haven’t read so that I can have a little more instead of having to wait!